Primarily, this house is an essay on one of the most important components of the English Cottage Revival Style: half-timbering. Of course, this half-timbering is “fake” in the sense that, unlike the 9th to 12th-century English cottages that the style refers to, the wood strips here are decorative, not structural. The curved strips in the dormer suggest Gothic arches. The curved strips at the corners of the large front bay are called crucks. In real timber-frame buildings, crucks are important structural supports. For comparison, see the photo of a real timber-frame farm house in County Kent, England. 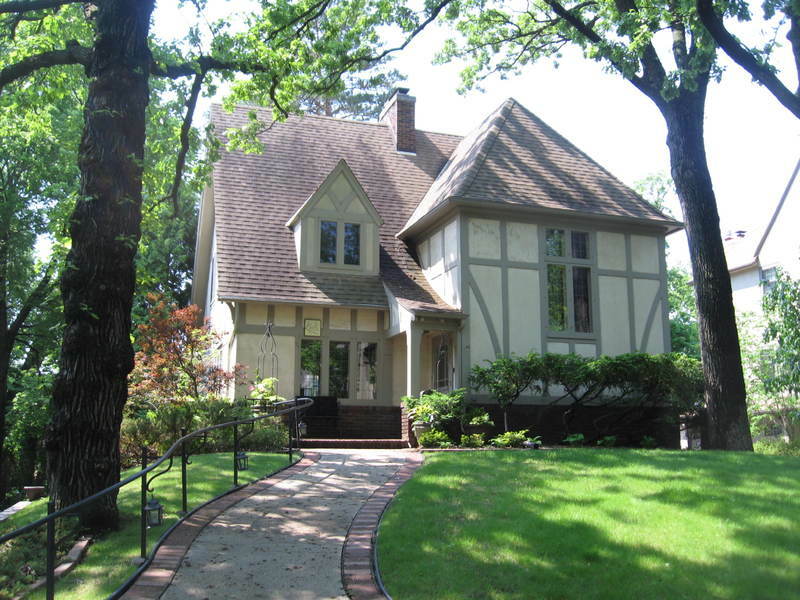 Richard L. Kronick, “2825 Brookwood Terrace,” Minneapolis Historical, accessed April 18, 2019, http://minneapolishistorical.org/items/show/120.